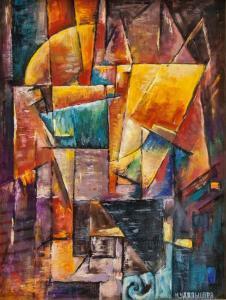 Find artworks, auction results, sale prices and pictures of Nadieshda Andreewna Udalzowa at auctions worldwide. Nadezhda Udaltsova Russian Cubist Gouache/Paper Gouache on paper, framed. Featuring a Cubist portrait. Signed N. Udaltsova in Cyrillic on the upper left corner. Attributed to Nadezhda Udaltsova (1886-1961, Russian) on the upper left corner. Nadezhda Andreevna Udaltsova was a Russian avant-garde artist (Cubist, Suprematist), painter and teacher. Udaltsova's professional debut was as a participant in a Jack of Diamonds exhibition in Moscow in the winter of 1914. But it was in 1915 that she really made her name as a Cubist artist, participating in three major exhibitions in that single year, including "Tramway V" (February), "Exhibition of Leftist Tendencies" (April), and "The Last Futurist Exhibition: 0.10" (December). Her paintings were subsequently collected and exhibited in the 1920s by the Tretiakov Gallery, the Russian Museum, and other venues as examples of Russian Cubism. Under the influence of Tatlin, Udaltsova experimented with Constructivism, but eventually embraced the more painterly approach of the Supremacist movement. In 1916, she participated with other Supremacist artists in a Jack of Diamonds exhibition, and during that same time period she joined Kazimir Malevich's Supremus group. In 1915–1916, together with other suprematist artists (Kazimir Malevich, Aleksandra Ekster, Liubov Popova, Nina Genke, Olga Rozanova, Ivan Kliun, Ivan Puni, Ksenia Boguslavskaya and others) worked at the Verbovka Village Folk Centre. 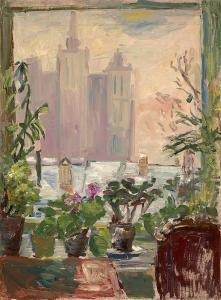 In the early 1920s, Udaltsova's work began to show a turn away from the radical avant-garde and a sensibility more aligned with artists associated with the Jack of Diamonds, among them Ilya Mashkov, Petr Konchalovsky and Aristarkh Lentulov, exhibiting her Fauvist portraits and landscapes alongside them at the Vkhutemas "Exhibition of Paintings" of 1923 and also at the Venice "Biennale" of 1924. She also continued to teach, including instruction in textile design at Vhkutemas and the Textile Institute in Moscow from 1920 until 1930. Under the influence of Drevin, Udaltsova returned to nature and began painting landscapes. Between 1926 and 1934 they traveled widely, painting the Ural and Altai Mountains, as well as landscapes in Armenia and Central Asia. From 1927 to 1935, she contributed to national and international exhibitions and participated with Drevin in joint exhibitions at the Russian Museum (1928) and in Erevan, Armenia (1934). 38 x 19 cm (15 x 7.8 in.). Frame size: 45 x 25.5 cm (17.7 x 10 inches). 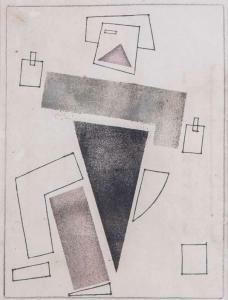 Nadeschda Andrejewna Udalzowa 1885 Orjol - 1961 Moskau Geometrisch abstrahierte Figur. Mischtechnik auf Papier, minimal stockfleckig. Gerahmt. 25 x 19 cm Passepartout-Ausschnitt. Provenienz: Privatsammlung, in den 1990er Jahren erworben bei Galerie Bodenschatz, Basel. Nadezhda A. Udaltsova (1885 Ofjol - 1961 Moscow). Geometric figure. Mixed media on paper, minor foxing spots. Framed. 25 x 19 cm passepartout size. Provenance: Privat collection, acquierd in the 1990s at Galerie Bodenschatz, Basel. Description: UDALTZOVA, NADEZHDA (1886-1961) By the Window Oil on cardboard, laid on canvas, 71.5 by 52.5 cm. Provenance: Elysium Gallery, Moscow (label on the stretcher). Acquired from the above by the previous owner. Thence by descent. Private collection, Germany. Exhibited: 70 let moskovskomu Soiuzu khudozhnikov, Tsentralnyi vystavochnyi zal Manezh, Moscow, 20 December 2002–20 January 2003 (labels on the stretcher).